Are you considering building a Barn or Shop? ​We have built hundreds of structures, and no two are exactly alike. Each client has his/ her own needs,wants and visions. Our job is to turn that vision into a reality. Whether you are looking to house one horse or a hundred, we can assist you in designing a functional, safe aesthetically pleasing structure. Maybe you prefer horse power? We have built many ,many shops and garages. Let us build your dream barn! Lance has been installing modular barns Since 1983. Our team has the knowledge and experience to get your barn built right. A poorly installed barn can be a nightmare, You have our personal guarantee that you will be happy with your barn! A large majority of our clientele are repeat customers. 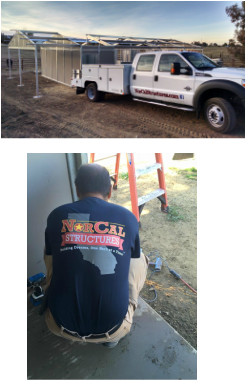 In the event your barn needs repairs or if you want to add on, or modify .. we want you to consider NorCal Structures YOUR personal barn team. Our commitment to you does not stop at the purchase of the barn. Repairs.. We have replaced a lot of porch posts hit by tractors over the years. Accidents happen. Barn Moves.. Are you considering moving , but dont want to leave you barn behind? We can move your existing modular barn ! We have experience moving most barn manufactures product. Add Ons: Did you know we can reconfigure or add on to your existing structure?. Have your kids have grown out of their horses and are now into horsepower? We can convert that barn into a Garage / shop. Maybe your herd has increased and you need foaling stalls. ?No Problem. We are here to assist you in creative solutions to best achieve your goals. Conversions: Have you outgrown your existing barn?, You may want to consider converting that inline to a breezeway barn. We can reconfigure your existing components and transform your existing barn into a more functional structure .